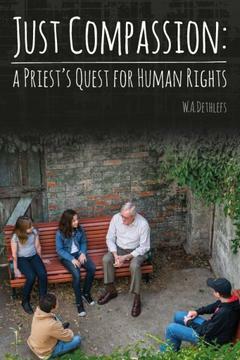 Fr Wally Dethlefs; Tafina Press, 2017. Few people manage to integrate passion, integrity and ethical principles in their life and work in the manner demonstrated by Fr Wally Dethlefs. His book portrays these qualities in an unpretentious narrative that offers inspiration. There is a longing in our communities to see these values galvanized in the organisations and institutions in which we find ourselves learning, working and engaging. For those who would love to see the disruption of ‘business as usual’ in social contexts where power and privilege dominate, Fr Wally’s book is a must read. His life story personifies the beautiful passage from the book of Micah in the Hebrew Scriptures to “act justly, love tenderly and walk humbly with your God”. In Australia, natural beauty and economic wealth abound. It is difficult to comprehend that the well-loved sentiment of a ‘fair go’ that reverberates in our national psyche, is so far removed from the lived experience and daily reality of a growing number of Australians. Herein lies the work of advocacy championed by Fr Wally and retold in his book. He has tirelessly demonstrated standing with and walking alongside those who have been marginalised. His book offers many examples of how he has challenged and unsettled the status quo; asking provocative questions; speaking for and with those whose voices are ignored and silenced. Fr Wally’s story highlights that the important work of advocacy is a social responsibility that should be shared by all, especially those of us who follow the Gospel of Jesus and those whose faith tradition shares the common commitment to compassion and action. Fr Wally reveals in his stories how reflection on action must go hand in hand with advocacy for social justice. In this book he clearly demonstrates his faith commitment that is imbued with the richness of Catholic social teaching – the heart of a tradition founded in the Gospel. So often Catholic social teaching is neglected by those of us who live in the comfort and ease of a nation that enjoys freedom, peace, wealth and abundance. Fr Wally’s stories highlight his willingness to interrogate power dynamics that disenfranchise the most vulnerable in our community. His lifelong commitment to authentic relationship with those who are excluded and those who are failed by systems that are meant to serve and support, is unfortunately rare, yet vital to the health and wellbeing of our nation. Such commitment offers radical hope. This book is a catalyst for reflection, an inspiration for action and a living example of belief in the dignity of all. It is this belief that underpins hope for a better future for all in our nation and in our global community. For those working in education, community development and any human services it offers encouragement.